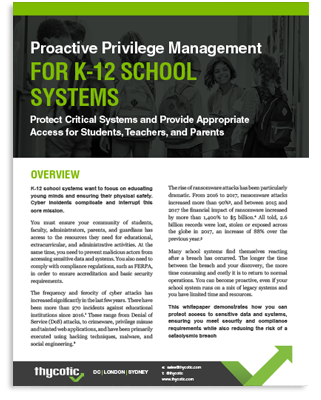 K-12 school systems have thousands of privileged accounts that allow faculty, staff, students, parents, and guardians access to IT resources. If those privileged accounts aren’t proactively managed and protected, they pose a major security risk. Malicious actors who gain access to privileged accounts can alter data, cripple key systems, or even hold them for ransom. This whitepaper demonstrates how you can protect privileged access to sensitive data and systems, ensuring you meet security and compliance requirements while also reducing the risk of a cataclysmic breach.